The GCX-26 is supplied in bulk. 1k pcs per bag is the maximum bag size for this product. 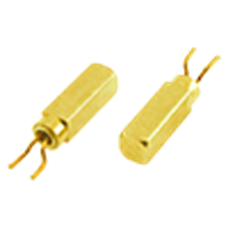 The GCX-26 crystal is available at frequencies between 30.0 ~ 165kHz and features a range of excellent frequency tolerance and temperature stability options. The GCX-26 is no longer recommended for new designs, if your new design requires a leaded product please consider the MS3V-T1R with formed leads as an alternative option. 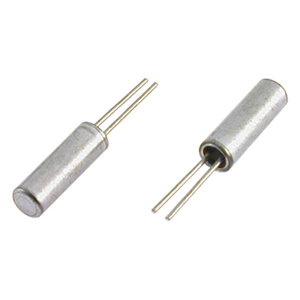 The GSCX-26 formed lead crystal is also an available alternative for new designs that require low frequencies. To request a quotation for the GCX-26 please use the configurable options form to choose the options you require and then submit your configured product to our team. Our expert advisers are always happy to help with your requirements and can be contacted on +44 1460 256 100 or at sales@golledge.com. The GSCX-26, with it's miniature cylindrical package and formed leads for surface mount applications, offers the engineer a very small footprint with low cost for high density applications. 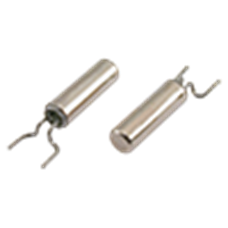 Available at low frequencies from 30.0-165kHz, and with industrial operating temperature range of -40 to +85°C.